I was having a charity shop rummage a couple of weeks ago and found some recycled sponge scourers in Oxfam. We’ve been using re-usable dish cloths but I hadn’t yet found an eco friendly alternative to scourers. We don’t have a dishwasher and I love cooking so scourers get a lot of use and lose their abrasiveness quickly. They are made from Polyurethane and packaged in plastic – so they’re not very sustainable and don’t degrade particularly quickly either. 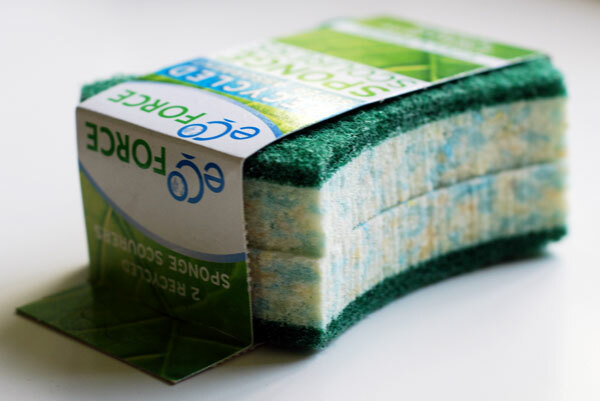 Eco Force’s scourers are ‘heavy duty scourers’ made in the UK from recycled foam. They are packaged with card made from 97% recycled paper. Product review coming soon!